Rockefeller Center is a complex of 19 commercial buildings in Midtown Manhattan that spans the area between Fifth and Sixth Avenues from 48th through 51st Streets. 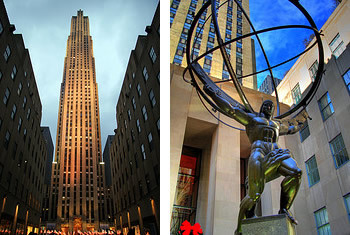 Named after its proprietor, Rockefeller Center is a national landmark that features many popular NYC attractions including Top of the Rock, the Radio City Music Hall, Rink at Rockefeller Center, and NBC Studios. The complex is also home to more than 100 unique shops and restaurants, making the area a premier shopping and dining destination. The Center is also home to seasonal events, such as the annual Merry Tuba Christmas concert and the Rockefeller Center Christmas Tree. Convenient parking for Rockefeller Center is available at the following parking locations. Click on a location listed in the map below for more information on parking or to reserve a guaranteed parking spot.